In recent years, visual content has been dominating readers’ preferences, whether it’s images, video or infographics. Their creation, unfortunately, is a bit more difficult and time-consuming than a regular blog post. So in this post, I’m going to cover everything you need to know about how to create an infographic and the tools that will do all the hard work for you. As a content creator, it’s important to bring some diversity to the content you provide in order to attract a bigger audience and to make sure you keep your current audience interested. People love infographics – and with good reason, if I do say so myself. They’re much more fun than regular blog posts and they provide a lot of useful information that the reader can go through in just a few minutes, which are just some of the reasons why infographics have a much better chance at going viral in your niche’s audience. Infographics are colourful and eye-catching and so long as the title is also catchy, you massively increase your chances of driving traffic. Another great part about infographics is that if you create a good one, you can host it on other websites, and other bloggers might want it on their blogs as well, which means you’re going to get a lot of links back to your website. So when you’re planning and strategizing your content calendar, make sure to add a few ideas for infographics – and make sure you also have time to promote it so you can get the most out of it. So, you’ve decided to create your own infographic – now, the question is, what should it be about? There are plenty of other types of infographics, and these are just some of the more common ones. But you can turn any idea into a beautiful, engaging infographic with a bit of imagination. 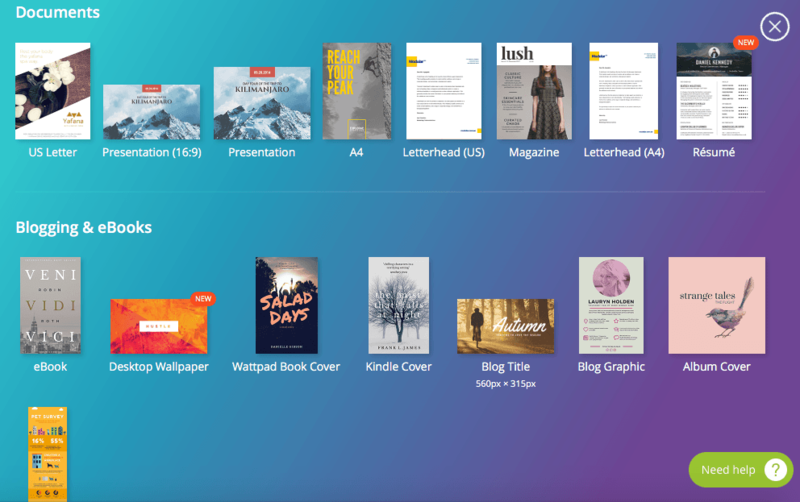 Many don’t even try to create an infographic as they believe you have to be a designer in order to do so – however, there are now plenty of really cool, free and cheap tools that basically do all the hard work for you. 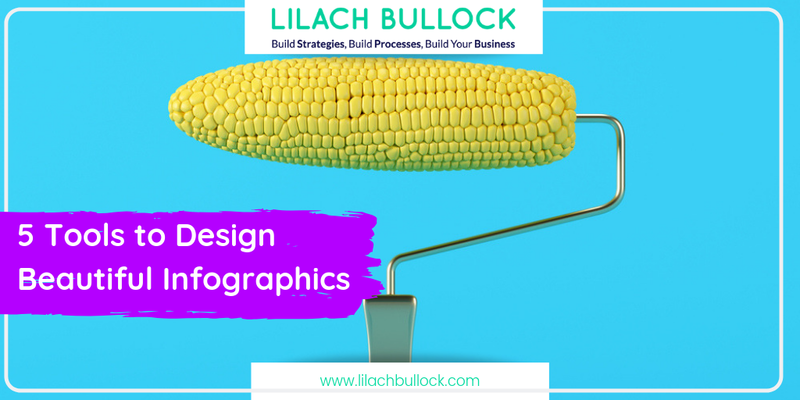 Or, if you want to create a more complex infographic strategy, there are numerous agencies that can help with that and create the infographics for you. This, though, can be a bit more costly than creating them by yourself. Visme is a favourite of mine as I’ve recently worked with them on some infographics and absolutely loved the results. With Visme, you can turn any of your ideas into beautiful visual content, such as infographics, presentations and reports. You can very easily create a new account by signing in with Facebook, and get started on your project right away with one of their templates. They have some beautiful templates to choose from, and if you want access to all of them, you have to upgrade your account to premium. Visme is very easy to use and I really like their selection of animations, images and even audio and video – basically everything you need to create a stunning infographic. Canva is another one of my favourites of the list and I often use it for both infographics and creating images. It’s a free tool that is incredibly easy to use by anyone, even without any design or Photoshop knowledge. If you want, before you start designing, you can check out one of their really good tutorials that cover everything from choosing the perfect font to writing the perfect headline. They also have a tutorial for creating infographics that you can check out. To start creating your infographic, simply click on “More” under “Create a design” at the top of your Canva account, and then scroll down until you get to infographics. From there, it’s very easy to start creating your own. Simply choose a template for your infographic, and start adding your text and choose between the images and elements provided by Canva, or even upload your own. They have a lot of free images, but for some of them, you have to pay. 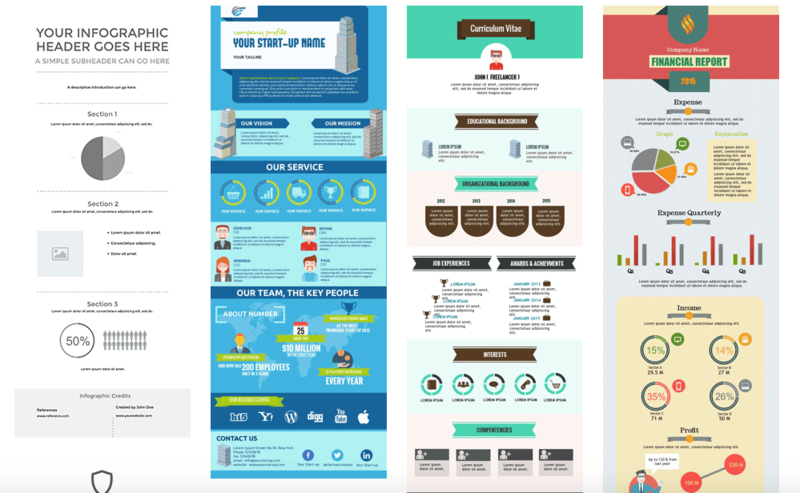 Piktochart is a tool dedicated completely to creating infographics. You can create an account for free, but if you want access to all of the templates and get extra space for uploading your own images, you have to choose one of their monthly packages, which aren’t too costly. They have a library of over 500 different infographic templates that is updated weekly, and some of them are completely free to use. It’s also great for creating beautiful reports and presentations that will definitely impress your clients. Venngage is very similar to Piktochart, and just as easy to use. You can start creating infographics for free, but you’ll only have access to a limited number of templates, although enough to keep you going as a beginner. Just like with the previous tools mentioned, Venngage is very easy to use. All you have to do is choose a template, and start designing: add the text and charts you want and use images from the Venngage library to bring your infographic to life. You can also change the colours and fonts if you want to, and make it completely your own. With Easelly you can get started on your first infographic in seconds – you don’t even need to create an account. They have a lot of different templates to choose from, and once you get to the front page, all you have to do is click on the one you want to use. From there, the process is very intuitive. You can change the theme if you want, or start from scratch, add cute animations, charts, text and YouTube videos, and much, much more. All of these tools are very easy to use – in fact, even as a beginner, you could probably create an infographic in about 30 minutes, so long as you don’t get lost in all of the images, animations and icons, like I sometimes do. Infographics are a big part of content marketing in 2016, which is evidenced by the numerous tools that have popped up in recent years. There’s no excuse not to start creating your own infographics right now. There are so many great tools that you can use to design beautiful visualisations that will not only bring you in more traffic, more engagement and shares and more links, but that will also make your work day much more fun. Great post; we’re spoiled for options here. Though, yes Visme is much ahead of the curve atm. Have never tried out venngage; thanks for the heads up. Cheers! Visme looks really really good. Amazing post! So grateful that somebody posted the ‘how to promote your infographic’ or something to that effect, that led to this post. Fantastic value! I have a canva account and seriously under utilize it. Will play with the infographic tool and then go back to that original post and take action on sharing it. Subscribed too and look forward to more great content. Hope i can be of value to the community too. Thanks Joseph 🙂 Yes Canva is fantastic and so easy to use, one of my favourite image tools. What do you recommend most? Thanks Abdul 🙂 I’m a huge fan of Canva – probably use that the most at the moment! Congratulations on your post , it is very complete. We don’t know if you have used genial.ly before but it is a very useful tool to create animated and interactive content very easily. We think it will be very interesting for you to take in consideration Genially in your next articles.